The five pig farms we started in 2015 are doing very well. Many piglets are being born and families are very excited about future income. The simplest way for families to earn money is to sell all piglets at 45 days old. 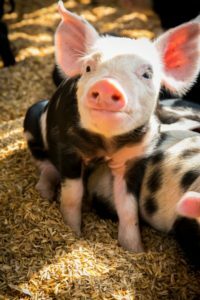 Pigs average a minimum of 6 piglets, two times per year, that they can sell. We’ll be starting pig farms in three more villages in 2016, for a total of 11 villages. We estimate that over 6 years, 50 of the poorest families to have a pig farm, will generate a minimum combined income of $22,500. Lone Chin, one of our graduated villages, has over 100 pigs right now! 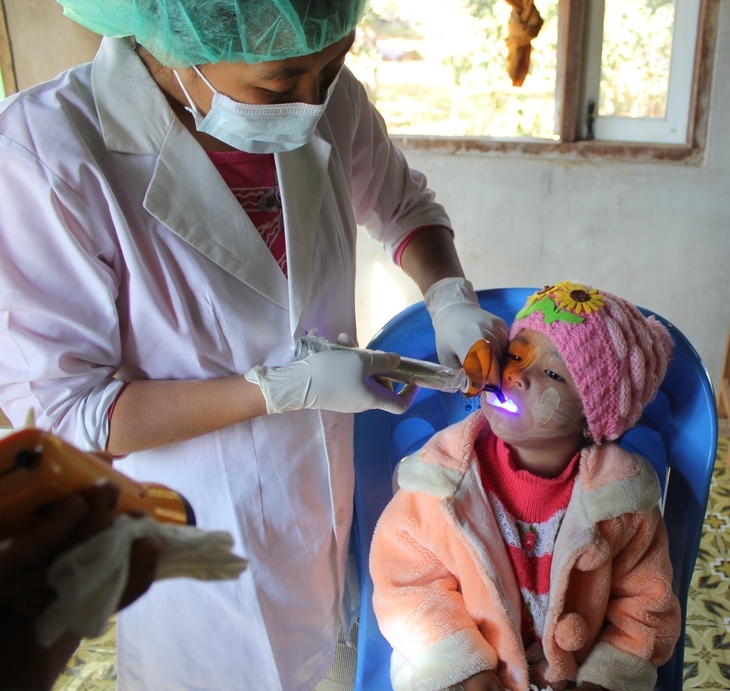 Throughout the month of January, 19 dentists of the Taunggyi Dental Association provided services at our dental clinics which reached 486 village children and 25 village adults from eight villages! Everyone who attended received a new toothbrush, toothpaste and most importantly instructions on keeping a healthy smile! My name is Nang Pe and I live in Ga Naing Nge West village. I have three children and myNang Pe and VNM GNNW husband is Khun Lan. We grow cheroot leaves that are used to make cigars. When I was pregnant with my last child, I took prenatal vitamins from our Village Nurse Midwife (VNM), Phyu Thazin Oo, but I didn’t plan to deliver my baby with her because I had successfully delivered my first two children with the Traditional Birth Attendant (TBA, an untrained woman who assists at births) from the village. But the last birth, when I used the TBA, was really difficult for me. Three hours after the birth, the placenta had not come out and my abdomen was very painful. My baby was very cold and the TBA didn’t cut the umbilical cord. I was very afraid and I thought my baby and I would die. The TBA told me to wait and it would all be ok. Finally, we called for Nang Phyu Thazin Oo who would understand my condition. When the VNM arrived, she asked about my symptoms and she cut the baby’s umbilical cord. She told me to go to the hospital immediately and that we should not waste any more time. It is not easy to get to the hospital in Taunggyi and took about one hour by motor bike and the VNM went with me. The doctors at the hospital invited her to the delivery room to assist in removing the placenta. All the doctors from the hospital told me she saved my life. 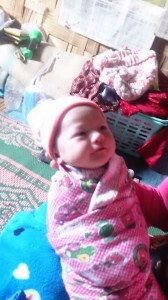 Baby Nang PeIf Nang Phyu Thazin Oo was not there, I am sure I would have died. Now, I understand very well about health care. I will teach the other women in our village how important it is to use our VNM. We are really lucky to have a clever and patient nurse midwife for our village. Nang Phyu Thazin Oo works unselfishly and patiently for our village and is trusted by the villagers. Now, it is ok to talk about disease, health care and medicine. If I am ever ill, I will go to her for care. And, after our VNM gives vitamins to the under 5 year’s old children, the children are healthier and stronger than before. I am very thankful to Shanta Foundation who is helping our village in many ways. Eight students and two professors with Engineers without Borders (EWB) from Fort Lewis College arrived in Pone Tan in early May for two weeks to build the brand new water system and are staying in the homes of the villagers. 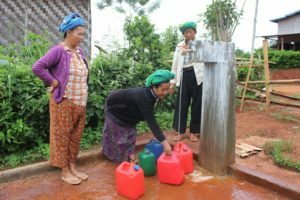 During this time they are working alongside the villagers to build one tank, a hydraulic pumping system, and 12 water taps spread throughout the village. The villagers had a lot of prep work to do before EWB arrived. They dug one trenches for water pipes 20 inches deep and 1000 feet long all by hand using just pick-axes and hoes. Then they made, by hand, 1,000 bricks! But they know that all this work is worth it as they will finally have easy access to clean water! Nge Nge, our regional director, and Laurie Williams, from EWB, led a group with all of the women to talk about hygiene and keeping their water containers clean. Thar Nge, our infrastructure manager, and Rolly Williams from EWB, led a similar group meeting with the men. They cut open one family’s water container (usually an old motor oil container) and it was filled with algae and very gross. If a family brings in an old water container to be replaced, we will give them a new three-gallon container to use to collect water from the taps. Muditar is a 2015 Grant Recipient! Muditar will train and supervise 60 women in twelve villages as Village Health Educators (VHE) to facilitate a series of Safe Motherhood workshops in each village, reaching over 1200 women, to teach them about healthy reproductive behavior, such as family planning, prenatal and postnatal care, safe delivery options, and better infant care such as good nutrition, breastfeeding, immunizations, and monthly growth monitoring. Women’s groups will be established to discuss very personal issues such as contraception use, family planning, empowerment, finances, and future hopes. This program will save lives, help babies thrive, mothers to be healthy, give women a choice, and create a basic healthcare system in a place that currently has none. Thank you to the Dining for Women community for your generous support in making this possible! Nang Htun, wife of carpenter Khun Kyaw Moe and mother of one son, is the Village Nurse Midwife of Lone Chin village. Before attending the 6 month training to become a midwife she was a farmer in the fields. Before the village had a nurse midwife, sick people had to walk to a nearby town to receive treatment. Pregnant woman who weren’t able to deliver at home with the traditional birth attendant, had to go far away to see a midwife. This situation put many pregnant women in danger. Since the clinic is so far away, most of villagers didn’t treat their minor illnesses and some of the illnesses then caused more serious side effects like diarrhea, hypertension, and skin infections. 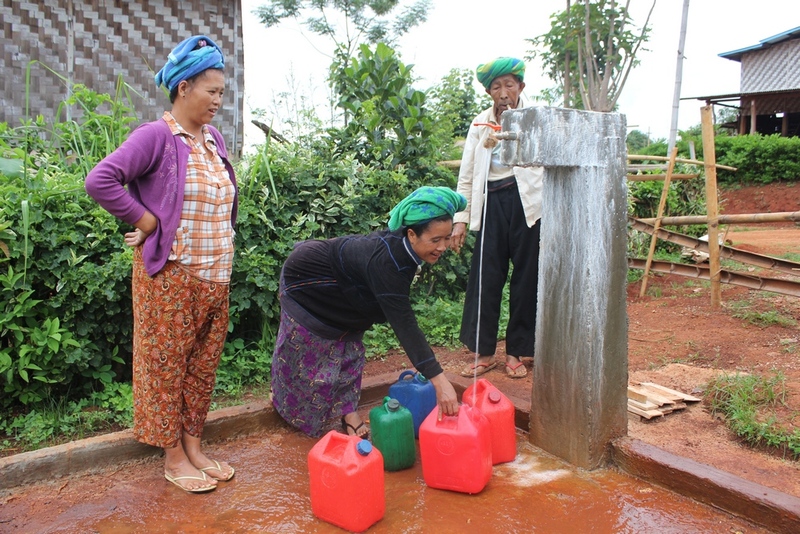 Now Nang Htun supports and cares for the villagers’ health. Most of the villagers come and take medicine, get contraception and get health education how to take care themselves at home when they are sick. She has delivered babies, provided prenatal care, and saved a sick villager’s life. A villager went to her with deep yellow skin and she knew that it was serious case. Nang Htun took him to a tertiary center (Taunggyi Hospital) to get proper treatment. “Doctors from the hospital said we arrived just in time and I saved his life”. Now that villager can work again in his field. 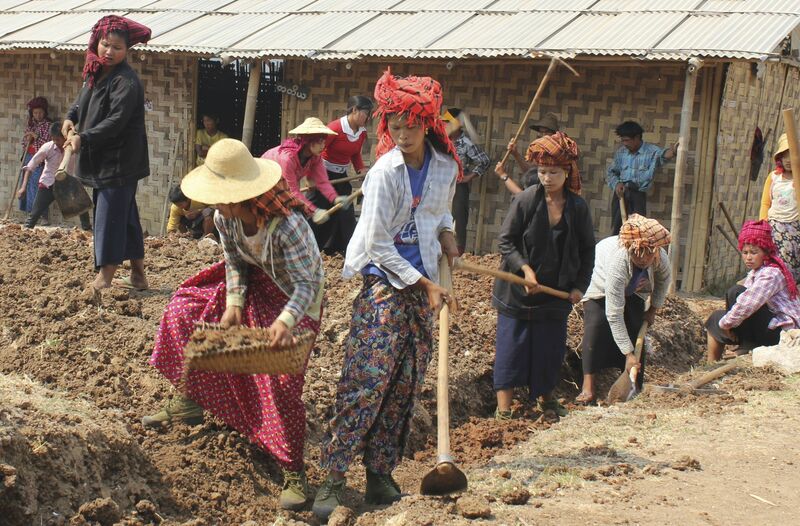 A hundred women and men, young and old, came together in late March from Khun Dong and Naung Lyout villages to break ground for their new, shared primary school. Using pick-axes, hoes and shovels, they worked all day in the searing heat to dig a 3-foot deep foundation for a school that will be 90’ x 30’. They are very excited to finally be able to provide their children with a decent education in a building that will have windows, a floor, desks and benches, and separate classrooms for each grade. The school they are replacing is a very simple, small bamboo room with bamboo slats over a dirt floor with no windows or room dividers. For five grades, it is a difficult place for the 70 children to learn. Nang Than Gee, a 20 year-old woman from Naung Lyout village, never attended school because there was no school when she grew up. She is proud and excited to be part of the groundbreaking efforts and are grateful that the children of the village will have an opportunity that she never had. Next, the villagers will start building the walls, after making the concrete blocks themselves. They plan to be done in June when the new school year begins. A video about the new school and the villagers can be seen here. 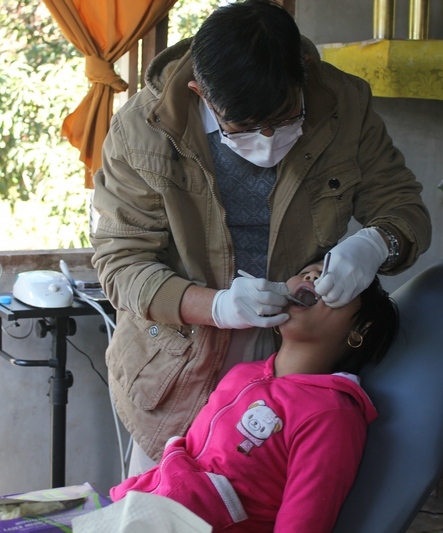 In the end of December we held our annual dental clinic. 367 children were examined and 239 received cleanings and fillings and 26 adults also received treatment. The two volunteer dentists and our staff held workshops showing the children how to take care of their teeth and distributed 427 tooth brushes. This is the first time in the children’s lives that they have received any kind of dental care and many adults suffer from ongoing pain and decaying teeth. We are grateful for the financial support that made the dental clinic possible and to the volunteer dentists for making time to participate in the clinic! 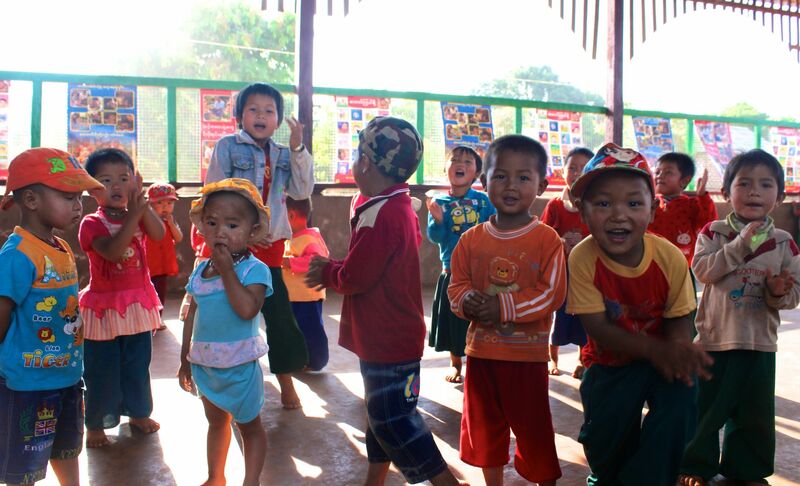 Because of a generous donor, the students of Pone Tan village have a new and improved primary school to attend. Their old school was small, dark, and falling apart. Their new school now has five classrooms, an office for the teachers, concrete floors, a new roof, and lots of windows to provide fresh air and light. 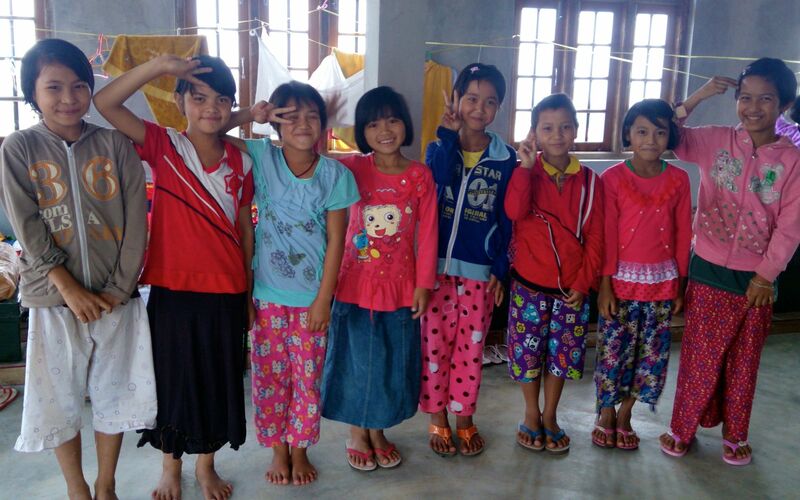 The teachers put together a list of school supplies and the Muditar staff was able to purchase the items in Taungyyi and take them up to the village. The students now have new desks, chairs, a volleyball game, a small monkey bar, solar panel and lights, and a television and DVD player! We can’t tell what makes the students more happy – the new desks or the playground equipment! U Mone lives in the village of Ga Naing Nge West, a partner village in the Shan state. He is 44 years old, his wife, Nang Loon is 45, and they have three children. His youngest daughter, Nang Kyi Htwe, attends the Muditar boarding school on a scholarship from a U.S. donor. His two eldest children have only a primary school level of education. Ten years ago their home burned down. U Mone is blind in one eye from a work accident. Up until two years ago U Mone was a carpenter but his carpenter group dissolved and he no longer has work. He owns two fields and grows cheroot leaves in the field near his home and no longer uses the other field because it takes him too long to walk to it. Cheroot leaves are used in cigarettes, but the value of the crop has plummeted over the past few years. The family has faced difficult times in their life, however, U Mone feels like their luck is beginning to turn around because of Muditar Foundation. 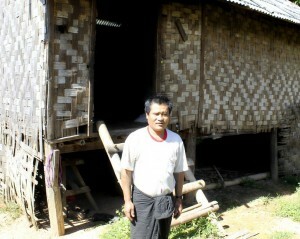 U Mone now has a pig farm, started with help from Muditar and it has the potential to triple his family’s income! And, they are really happy that Nang Kyi Htwe is receiving a scholarship and furthering her education. Nang Kyi Htwe is the “the sunshine of their family” because she is smart and studies hard. The family now has a lot hope for their future. The new preschool is complete and our staff says that this is our best preschool yet! It is made of concrete block, is spacious and has indoor and outdoor space for playing. Two teachers, chosen by the village, attended a training by the Metta Foundation, a large local aid organization that partners with Muditar on some of our projects. There are 40 children attending and happy to be playing with their friends, and their parents are happy they are in a safe clean space and not out in the fields. Five young women, handpicked by their villages, began a 7-month training program in June to become nurse-midwives for their villages. They will be able to provide important maternal and infant health services plus care for the general population and will form the core of our health services in the village. They will be given a medical kit upon graduation and be supervised monthly by Dr. Nge Nge, our health director, to ensure a successful career and medical practice. This program has been very successful in our other villages and as the VNM’s earn respect and credibility, they earn a good living providing more and more health services for their village. We now have trained 10 midwives who are serving over 2300 women in 10 villages! We will train seven more midwives in 2015. We are very happy to announce that our new boarding school has opened! On May 19th, 10 students selected by their villages will move to the new facilities in the city of Taunggyi. They will have a couple of weeks to acclimate to their new ‘home’ and classes begin on June 2nd. The students will attend regular public school as required by the state. However, the boarding school will provide four to five hours per day of small group tutoring, using progressive teaching techniques and experiential learning. This will be a significant improvement in educational methods and standards from the rote learning taking place in the public schools. Learning English and extra math instruction will be the emphasis during the weekends plus there is a monastery and middle school right next door to use for playground activities. Donor sponsors from the US are covering the majority of the student’s costs and will establish monthly correspondence with them. This helps the students practice their English language studies and also enables the sponsors to develop a close connection with their students and stay up-to-date with their progress. Each year two more students from each of our villages will be selected to attend the boarding school. We are very happy to provide these students with this opportunity to receive quality education and look forward to following their progress through their five years of schooling. Our summer English language school just completed another successful season, with 38 students attending for eight weeks! 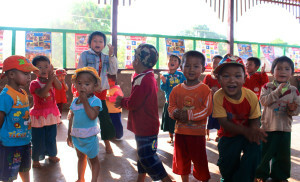 Although English is taught in Myanmar public schools, it is not done very well. Our two teachers used a variety of methods to teach English, and allow the students to practice and have fun. The villages invested $225, with Muditar covering $1,100 of the costs. The students will need English for future jobs, graduation tests and advanced schooling.